Studying the styles and techniques of other guitar players is a fantastic way to improve not only your own guitar playing skills, but your overall attitude towards your guitar playing. One such great who is worth checking out and studying is Chet Atkins, and in this article we will look at a few key aspects of his technique that made up his style of playing guitar, and how these will help you become a better guitar player. Chet’s underlying style was country, however he was fluent in many other styles of guitar playing too including jazz, classical and flamenco. To try and cover everything that Chet Atkins did with his guitar playing in a single article is impossible, so we will look at a few key elements and techniques that were the cornerstone to his overall guitar playing style. But first, why study the styles and techniques of other guitar players? Well, the answer is kind of obvious right, to get better with our own playing. This is certainly true, and studying particular guitar players such as Chet Atkins will give you a great insight into their style and technique of playing guitar and in turn influence the way you play your guitar. However studying and learning the guitar techniques and guitar styles of other players will also have a big influence on your attitude towards your own playing. Because you not only get influenced by someones actual style and technique of playing guitar, but you also get influenced on how they approach their guitar playing. In other words, their attitude towards their playing. You basically want to be able to do what they are doing, so you go beyond simply copying licks and riffs and get more into how they got to their level of guitar playing and what is required for you to do the same. Studying the styles and techniques of other players such as Chet Atkins can also reignite your motivation and inspiration. There have been several times over the years that I have become stale with my own guitar playing, only to find new inspiration and creativity through discovering new players, and studying their unique approaches to playing guitar. So without further ado, let’s get into some of the key elements of Chet Atkins' guitar playing style and technique. One of the main features of the guitar style of Chet Atkins is what’s known as “travis picking”. Travis picking is named after the guitarist Merle Travis who was a massive influence on Chet’s own guitar playing. This technique is all about using the thumb of your picking hand to play a steady bass note pattern on the lower 3 strings of your guitar. Your index (i), middle (m), and ring (a) fingers are then left to play syncopated rhythms and melodies on the higher strings. The result is an amazing combination of bass, harmony, and melody that will have people think they are hearing multiple guitar players playing when it is in fact just you! If you are new to fingerpicking your guitar, check out this article on how to fingerpick your acoustic guitar the right way. This technique of Chet’s did differ a little from Merle’s. While Merle would play 2 bass strings with his thumb simultaneously (on the 1 and 3 beats), Chet’s picking would sound more like a stride piano, striking single bass strings of the guitar at a time. The above is commonly referred to as a 6, 4, 5, 4 bass picking pattern in reference to which strings the notes fall on and in which order. It’s the pattern of choice for chords with root notes that fall on the 6th string of the guitar. Another common variation Chet would use for these types of chords was a 6, 4, 6, 4 picking pattern where the bass notes fall on the 6th and 4th strings. A key element to this aspect of Chet’s guitar style is to palm mute the bass notes. This is so that the melody and harmony parts, when added, will stand out more. Now we're cooking! There is a bit going on here so you want to take it slowly, and never lose sight of the bass note pattern, as it falls on the beat and is the driving force behind the line. As always, listen to the audio of the example carefully as this will help greatly in getting it down. Remember to mute the bass note picking pattern so that the melody notes on the higher strings ring through in contrast. Notice that some of the melody notes in the example above fall on the beat with the bass note, while others fall in-between the beat. Using your bass note picking pattern as a reference for where the melody notes fall will help a lot with the timing of everything. Notice that the bass note pattern has changed to a 5, 4, 6, 4 pattern in reference to which strings the notes fall on and in which order. This is the pattern of choice for chords with root notes that fall on the 5th string of the guitar. Another common, but less used variation Chet had for these types of chords was a 5, 4, 5, 4 picking pattern. 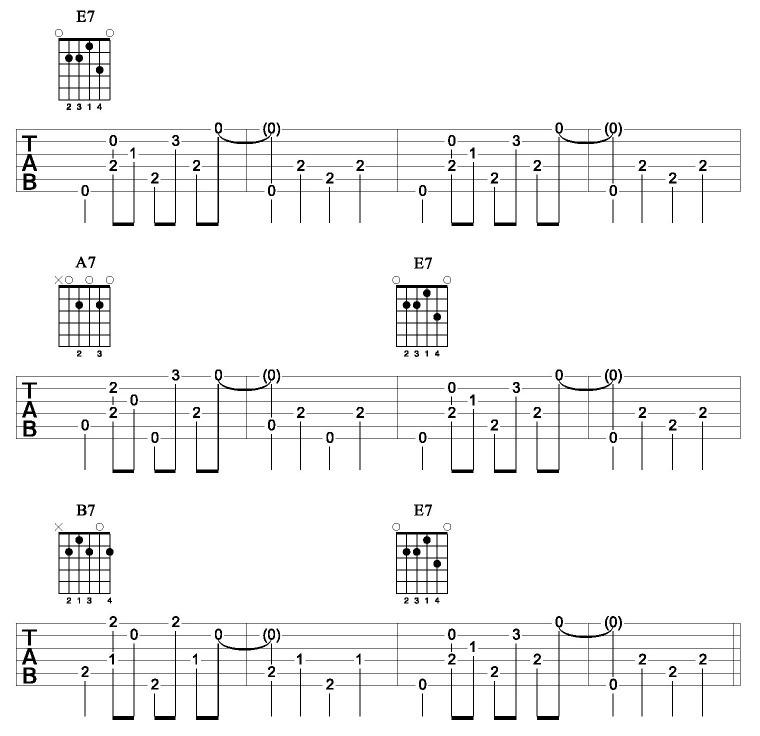 Another fantastic element of the guitar style of Chet Atkins was his extensive use of double stops. Put simply, a double stop is a guitar term used for playing two notes at the same time. These notes can be on adjacent strings and non adjacent strings. Chet mainly used 3rd’s and 6th’s when it came to double stops and would often use these to harmonise melodies. He would also use them to create fills that provided a really nice counterpoint to the vocal melody of a song. Here are two fretboard diagrams depicting 3rd’s and 6th’s on the higher strings of your guitar. Studying these, and the patterns that they create, will go a long way to you understanding them and being able to apply them to your own guitar playing. * The numbers indicate the fingers to use for each double stop. There are several ways you can go about it, depending on the context. Keeping your second finger on the third string as a constant is one such way. This first lick connects a D7 chord to a G chord using a combination of 3rd’s and 6th’s. Chet would often slide in from a fret below for a cool sound. This lick falls on a static chord, G7, and has some single notes mixed in with the 3rd’s. Adding embellishments to your double stops, like the pull off in the last bar of this example, sounds very cool. The final lick connects a C7 chord to an F chord, much like the first example, only you are exclusively using 6th’s in this one. Double stops using harmonies such as 3rd’s and 6th’s aren’t only part of Chet Atkins' guitar style, but also an essential tool for the acoustic guitarist. They provide a very cool and unique sound, bringing great contrast to your single note lines. I strongly recommend that you get these into your acoustic guitar playing as soon as possible. We have barely touched the surface in regard to Chet Atkins' guitar style and technique. However the above will certainly get you started with some cool approaches you can add to your own acoustic guitar playing. If you like this kind of thing then definitely check out some of Chet’s arrangements. There’s hours of fun to be had. Another important element to the guitar style of Chet Atkins was his use of banjo rolls. Check out this ebook and audio download all to do with cool banjo roll patterns you can use in your acoustic guitar playing today.